This collection is a parachute onto the front lines of the nature-nurture debate. By far the most up-to-date, balanced, and encompassing reader on the all-important topic of human nature. A cornucopia of crucial and adversarial approaches to the scientific foundations of our contemporary grasp on whether, to what extent and exactly how heredity, development and social learning interact to produce human nature. One could as easily spend an introductory term or a scholarly lifetime working through some or all of this vast but thoughtful anthology. From classic evolutionary psychology texts on human nature to some of the most exciting modern day treatises on innateness, Downes and Machery's latest collection is sure to become a classic in cognitive science. Astonishingly, the claim that all humans have something in common is currently one of the most controversial claims a scientist can make. If you find this as puzzling as I do, Machery and Downes’ Arguing About Human Nature will help you to understand what all the fuss is about. Its collection of new and classic essays on the human nature controversy reveals why studying ourselves is one of the most difficult scientific challenges of all. This collection is a delight. The essays are smart and clear and accessible, from some of the best scholars around, and the topic is the deepest of them all—what it is to be human. I would highly recommend it to anyone interested in seeing how scientists and philosophers can work together to help answer the questions that matter the most. 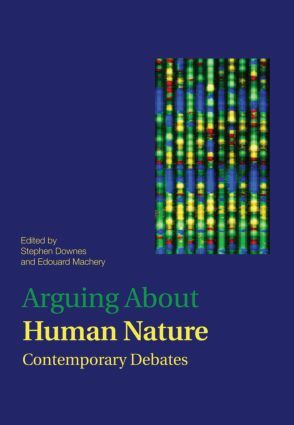 "The anthology 'Arguing About Human Nature' provides the most comprehensive selection available on philosophical anthropology."